Dashka Slater’s four picture books have won widespread praise for their inventive language and vivid imagery. Baby Shoes was named one of the best children’s books of 2006 by both Booklist and Nick Jr. magazines and was chosen for the Texas 2x2 list of best books for children age two to grade two. The Sea Serpent and Me was a Junior Library Guild Selection and a finalist for the Cybil and Chickadee Awards, as well as being named to the 2008 Librarians’ Choices List of the best books for children and young adults. Dangerously Ever After was named the 2013–14 Surrey Picture Book of the Year based on the votes of over 12,700 elementary school students. A recipient of a Creative Writing Fellowship from the National Endowment for the Arts, Slater is also an award-winning journalist whose articles have appeared in such publications as Newsweek, Salon, The New York Times Magazine, and Mother Jones. She is also the author of a novel for adults, The Wishing Box, which the Los Angeles Times named to its list of the year’s best fiction in 2000.
ship's deer crew, along with a flock of adventurous pigeons, and the animals set sail for Sweet Tree Island. seas give way to a star-studded sky, or in the peachy sunset washing over Marco and his new friends. experience that proudly touts curiosity and finding friendship in kindred spirits. Marco, a fox, thirsts to know everything: “Why don’t trees ever talk? How deep does the sun go when it sinks into the sea?” A ship appears off the coast of Marco’s forest. It’s crewed by deer (they’re poor sailors, they admit), and its figurehead is a stag with a massive set of antlers. Together with a flock of pigeons, Marco embarks on a nautical adventure in hopes of locating foxes who can answer his questions. The sailors encounter storms, dangerous rocks, and pirates before finding the island refuge they seek. In spreads that evoke seafaring motifs from the Odyssey to Treasure Island, the Fan brothers (The Night Gardener) lavish care on every delicate detail, from the ship’s rigging to the foam on the waves. Breathtaking seascapes alternate with cozy scenes below decks as predators and prey huddle peaceably. Slater (Escargot) creates a story to lose oneself in, an adventure packed with risk and possibility. The ship becomes a community, and Marco and his questions part of its journey. A fox sets sail in search of answers to questions about life, the universe, and everything in this picture book fantasy. Marco the fox wonders about many things, but the other foxes are more concerned with chicken soup than with philosophy. When an antlered ship appears, captained by deer traveling to an island of “tall, sweet grass and short, sweet trees,” Marco seizes the opportunity to seek out other foxes who may have answers. The crew sails across treacherous seas, triumphing over sharp rocks and fierce pirates before arriving safely at Sweet Tree Island. Alas, there are no foxes to be found, and Marco’s travels have only yielded more questions. Yet, he also has new friends and the chance for further adventures–perhaps that is enough. Slater’s adventure narrative is an epic journey with a classic feel, perfectly scaled for a picture-book audience. The straightforward text is lyrical, rhythmic, and begs to be read aloud. Graphite-and-pen illustrations by the Fan Brothers depict expressive, realistically drawn animals sporting the occasional hat or bandanna. 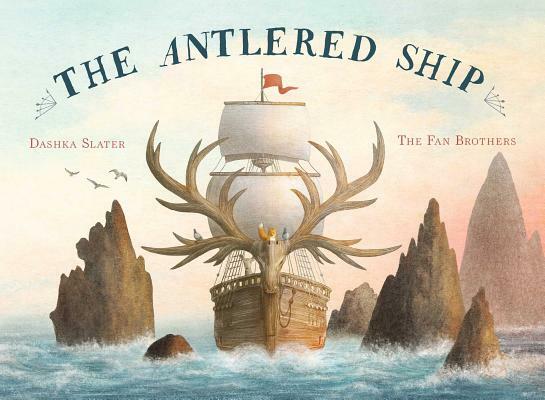 As the distinctive prow of the antlered ship sails through ethereal seascapes, young audiences can follow its path through the detailed maps included on the endpapers. VERDICT Marco’s discovery that the world is full of questions, but not always answers, is at once profound and entirely accessible to young audiences. Make this gently thrilling celebration of life’s big questions a first-purchase.